As a part of 4 refreshers training events, the Activating Village Courts in Bangladesh project organized its first day-long refresher session on the VC (amendment) Act 2013 at CCDB Hope Centre at Savar. 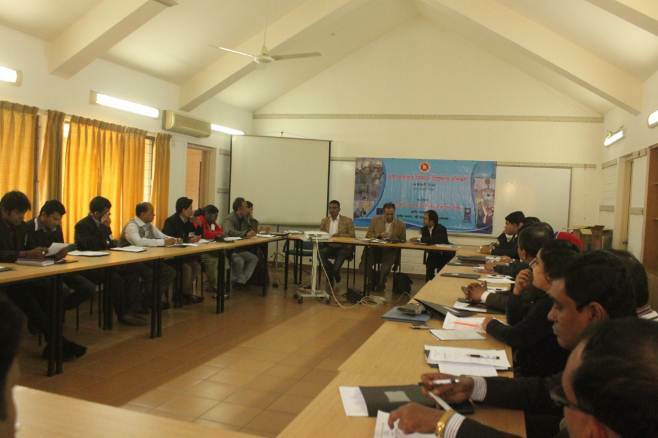 The training aims to orient the key field staff with the amendments and its salient features. The amended Act, gazetted on 25 September 2013, reflects several important changes e.g. increase in the pecuniary jurisdiction from BDT. 25,000 to 75,000; introducing option for mandatory women representation in the decision making panel, penalty for filing false cases, increasing penalty for contempt of court or non-compliance, etc. The first batch covered the field staff from Dhaka division where 28 participants took part. Participants of this refresher training are expected to support effectively and efficiently in further organizing and facilitating the field level stakeholder trainings particularly for UP elected representatives at their respective working areas. Mr. Anamul Haq, Training Officer and Adv. Uzzal Bhattacharjee, Program Support Officer of Village Courts Project conducted the sessions while Mr. Kamrul Hassan, Programme Specialist and Mr. Sarder M. Asaduzzaman, Project Coordinator were present at the beginning.